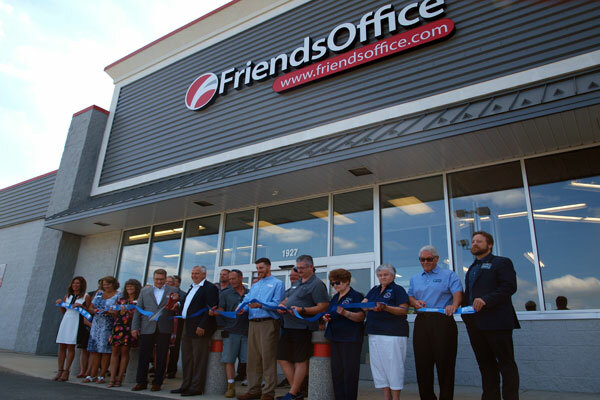 FriendsOffice is one of Ohio’s largest locally owned and operated business-to-business office suppliers with a newly renovated contract furniture showroom in Moraine. The $30 million and growing supplier has been led by CEO, Ken Schroeder, and CIO, Dale Alt since 1991. They purchased Salem Office Products in 2011, which was one of several smaller suppliers they have acquired in the past eight years and merged under the FriendsOffice name. The $950,000 sale of a former Staples building at 1927 West Dorothy Lane to Schroeder Commercial Properties LLC enabled the FriendsOffice Dayton employees to consolidate under one roof. After an extensive renovation period, the new offices and furniture showroom opened on June 28th, 2018. FriendsOffice employs over 110 individuals company-wide, including more than 20 in the Dayton area alone. The company’s additional Ohio furniture showrooms and office spaces include their corporate headquarters in Findlay as well as Avon, Kent, and Worthington.